NEW YORK — Shoppers and tourists in Times Square will be alerted to the dangers of genetically modified organisms thanks to a new billboard campaign. 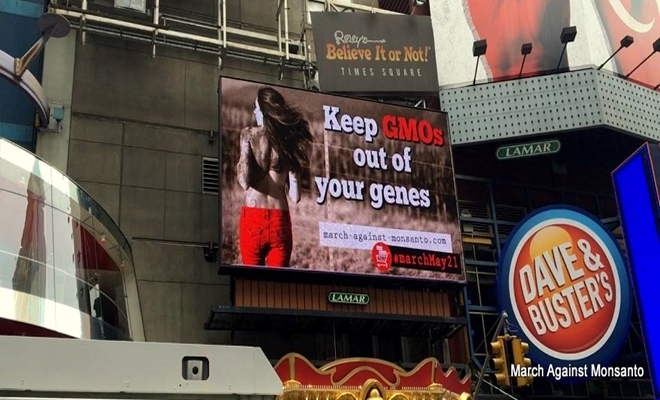 The anti-GMO billboard, sponsored by March Against Monsanto, is slated to run from April 25 to May 25 in the Manhattan hotspot. The campaign coincides with the 4th annual March Against Monsanto, an international event scheduled to take place in over 40 countries and on almost every continent on May 21. Studies by the Times Square Alliance suggest that over 300,000 people enter Times Square on foot every day, with pedestrian counts rising as high as 480,000 on the landmark’s busiest days. “Glyphosate, the cancer-linked herbicide that is an essential component in the expansion of GMO crops, is already being banned around the world over safety concerns. Here in the United States, glyphosate is consistently being discovered in everything from hospital feeding tubes and tampons to the breast milk of nursing mothers. The movement also objects to Monsanto’s close ties to the U.S. government. U.S. foreign aid to countries including El Salvador, Ukraine, and Haiti is often tied to agricultural reforms that require farmers to plant Monsanto seeds. The international agricultural giant is currently embroiled in a years-long legal battle with Argentina over efforts to collect royalties from farmers who replant soybean seeds from previous GMO crops. Earlier this month, giant grain trading corporations like Cargill Inc. and Archer Daniels Midland objected to Monsanto’s flaunting of international regulations that could prevent traders from selling American farmers’ crops to Europe.